This is the back of the 1980 Fur and Leather box. pictured second from left on the bottom. 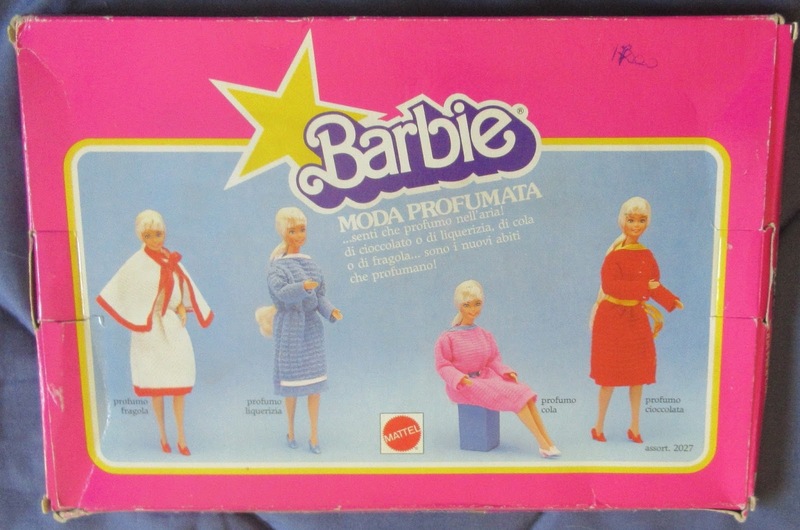 The SuperStar Barbie logo was still being used in Italy in 1984. This is the back of the Moda Profumata box. even though it is too big on her. 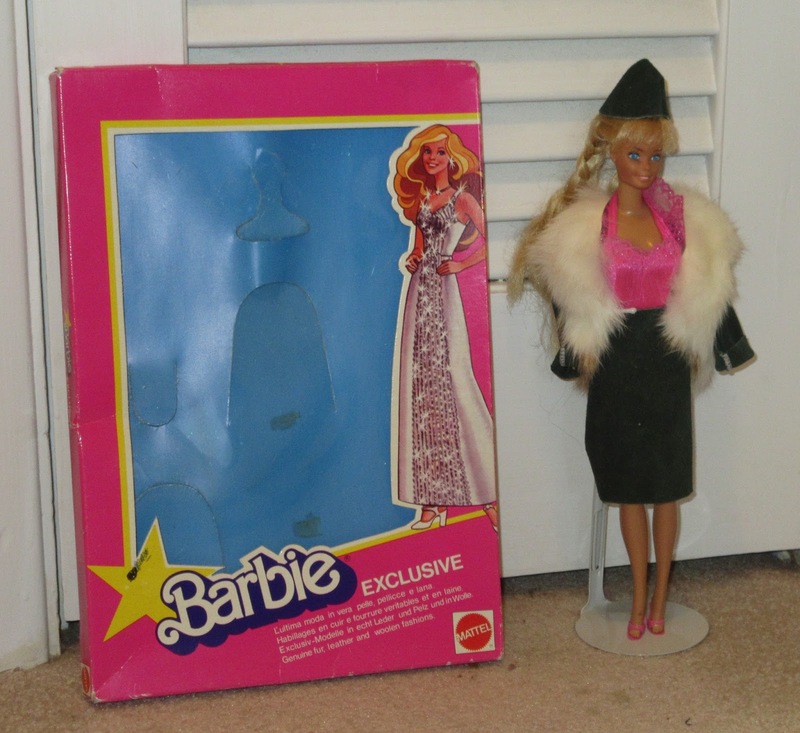 I own two SuperStar Barbie outfits from Italy, one from 1980 and the other from 1984. 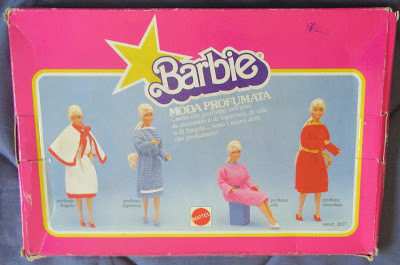 I am wondering if the Barbie dolls sold in Italy in the 1980s were slightly taller than their American counterparts, as the outfits were always too big on my dolls. None of the outfits were numbered, although one set's outfits were named. 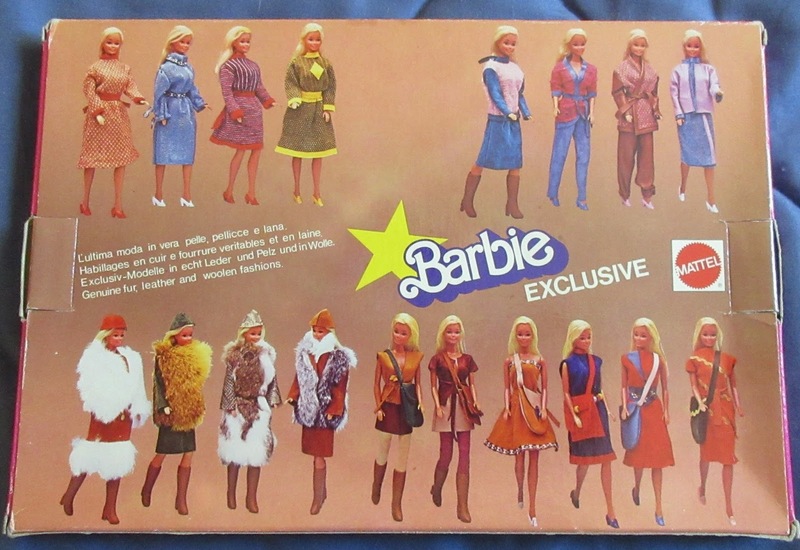 The 1977 SuperSize Barbie is on the cover of the Fur and Leather outfit, but it is not her size. The liner notes were in English, French, German and Italian. The English one said "Genuine fur, leather and woolens fashions." The copyright information, translated from Italian to English, read, "Giacatollo conforme alle prescrizioni di sicurezza del D.M. 31/7/79," that is, "Giacatollo complies with the safety requirements of the D.M. 31/7/79. " I assume that Giacatollo was the Italian manufacturer, while D.M. is the copyright or trademark. Since the exact date was listed, July 31, 1979, I presume the sale date was 1980. 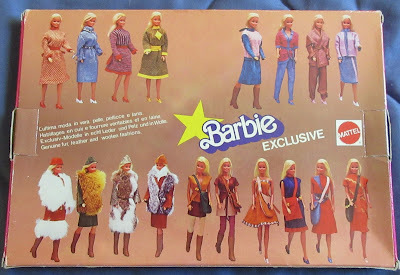 The doll modeling all the outfits was the 1979 Sun Lovin' Barbie. The liner notes were tiny! They read, "Giacatollo conforme alle prescrizioni di sicurezza della legge 18/2/83 No. 46." It meant, "Giacatollo conforms to the requirements of security of law 18/2/83." Again, since the exact date of Feb. 18, 1983, was mentioned, I assume the outfit was sold in 1984. Some notes: The scent of licorice on my outfit is long gone. The bottom center leather outfits on the package are really cool and look like something for a female Robin Hood, or perhaps Maid Marian. The leather outfits should really be worn by a straight-armed doll, as the leather is just a little stiff for bent arms to get through. the one on the right says "Dapperdo Originals." as the snaps are the same. I purchased two sets of baby doll items during my trek of the US 50 sale last weekend (more about the sale in another post). 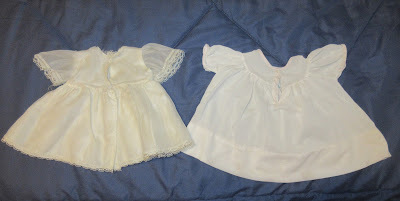 One was a doll wearing a dress that was too big for her; the other set of items was a bunch of baby doll clothes in a Barbie and Francie case (there were no Barbie clothes in the case, just baby clothes; I just wanted the case). First, an explanation. The doll you see on the left is a drink-and-wet doll, her eyes close and is 20 inches tall. She is the doll I had as a little girl in the mid-1960s. The reason she is in mint condition is that she was kept at my grandmother's house for me to play with there, and the doll didn't come home with me until I was in high school after my grandmother died. I have no idea what the doll's name was or who the manufacturer was. Her only markings on are the back of her neck, which say, "U 6V." I have one store-bought dress for her, although I don't know if it is what she originally wore. 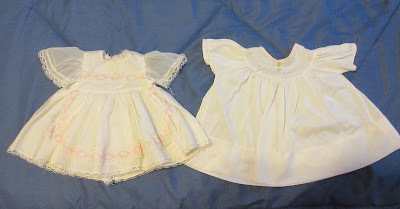 The beautiful white satin dress with the pink lace trim you see on the left is untagged but I have always had it. The funky sandals the doll is wearing have also been around for as long as I can remember. They have cardboard soles and the blue straps are cut out of what I believe is wallpaper! But they have to be store-bought as well because of the push-in snaps. I bought the smaller doll, 16 inches tall, during my sale-ing last weekend. She is also a drink-and-wet doll and her eyes close. Her eyes are faded and the poor thing is missing her left set of eyelashes. I've given her a good bath which brightened her immensely. Her markings on the back of her neck say, "Jolly Toys Inc." and there is also a logo just above her buttocks that says "3A." She was wearing the other white dress when I bought her. It's too big for her and has a tag that says "Dapperdo Originals." I also bought a Barbie case with baby doll clothes in it; some of which fit the bigger doll and some which fit the smaller doll. There were some Chatty Cathy clothes in there as well, which my Cathy has claimed. 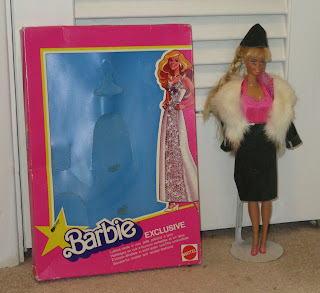 What attracted me to the smaller doll was how closely she resembled my original doll. Look at the moldings of the fingers and toes; they are identical. The eyes are the same as is the hair. They could be sisters! What are these dolls' real names? Was my original baby doll made by Jolly Toys? Was her original dress made by Dapperdo? Their secrets will puzzle me until the day I die! 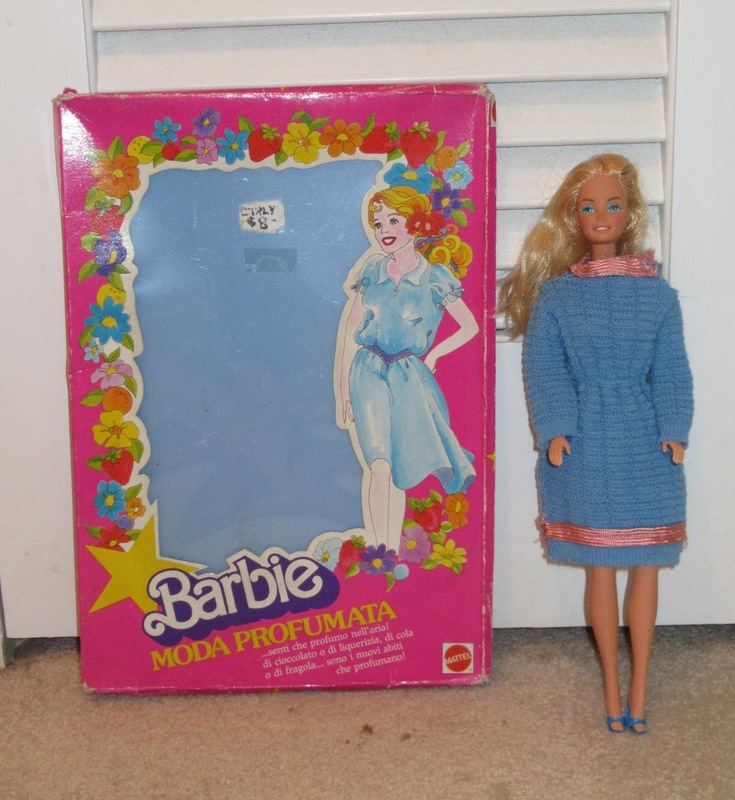 As an adult collector, I named the bigger doll "Meg" after a friend of mine. I have decided her "sister" will be named "May." On a related note, when I gave May her bath, I noticed after I had picked her up out of the water that she had really gained weight! I'm not sure how, but her torso had filled with water! It's taken several days for her to pee out all the liquid! I joked about this with another woman and she suggested buying the doll--who is probably 50 years old--some Depends! Is there such as thing as Depends for old dolls? Maybe I have found a new market for the adult diapers?! 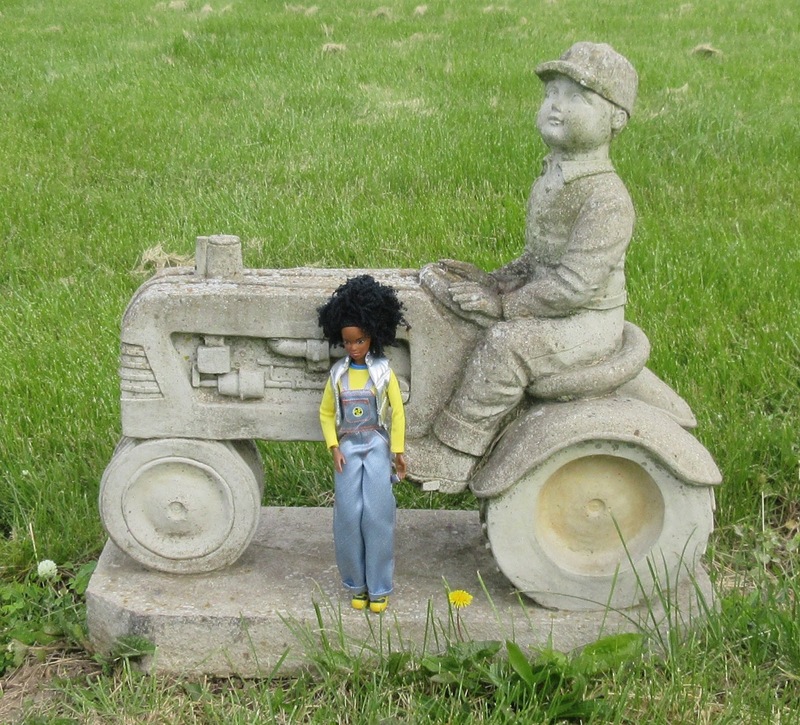 in front of a statue in an agricultural area. Now you can see that this is actually a statuette in a cemetery. I know it's a little tacky, but I have wanted to photograph this for a long time.